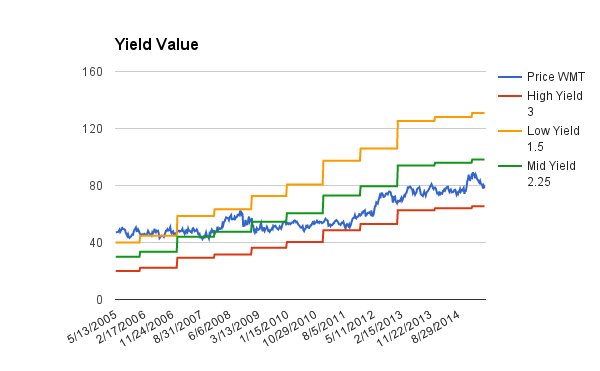 It's Yield over Avg Yield ratio is 1.09, but the other metrics passed or exceeded the screen. I currently don't have any positions in WMT, and definitely would like to add to the portfolio if the fundamentals are in place. I have implemented (a quick) due-diligence process to follow when I buy (or sell) any stocks. This article summarizes my thought process about WMT. This strategy follows the same framework as the SBI book. 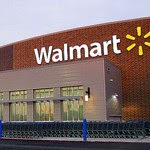 Walmart is an American multinational retail corporation that operates a chain of discount department stores (Walmart) and warehouse stores (Sam's Club). By revenue, it is the world's largest company, and is the largest grocery in the US. It is the largest private employer in the world with over 2 million employees. It has over 11,000 stores in 27 countries. The company operates in the United States and Canada, Mexico the United Kingdom (Asda), as Seiyu in Japan (Seiyu), and in India (Best Price). It also operates in Argentina & Brazil. It is also one of the world's most valuable companies by market value. 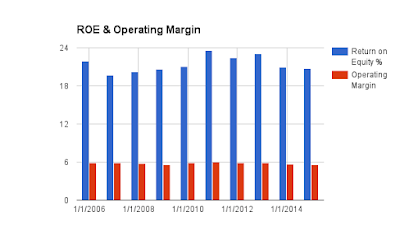 WMT has 42 years of dividend raises. 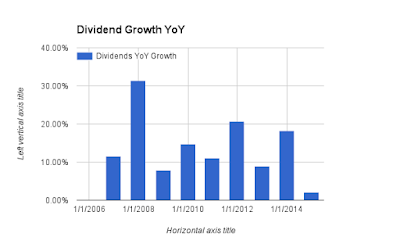 This is a good indication of continued dividends and dividend increases. These ratios provide an indication of how wide the moat is. I am looking for overall stability (or even better - growth). If the ratios decline year over year, then this is an indication of moat reduction. I also compare these ratios with other companies within the same sectors. As you can see, WMT is very stable in these ratios which indicates that Walmart's Moat is still very much intact. Here, I look for the stability of growth indicators over ten years using the EPS and Revenue. The 10 year average trendline is around 6% (Revenue) - 9% (EPS). 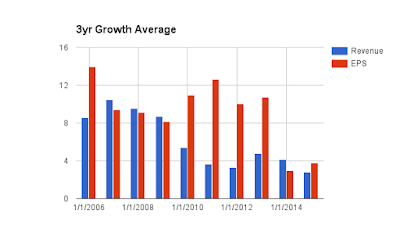 However, looking at the avg growth for 10 & 3yrs average growth paint a different picture. It is clear that Wal-Mart is not the same as Walmart from ten years ago. I think Walmart is essentially reaching market saturation in the US in terms of the number of stores. Growth opportunities will need to come into other areas - internationally or different segments of the market. 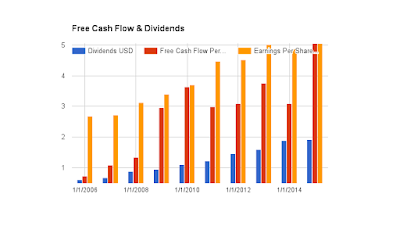 I use the free cash flow per share and compare this with dividends per share. 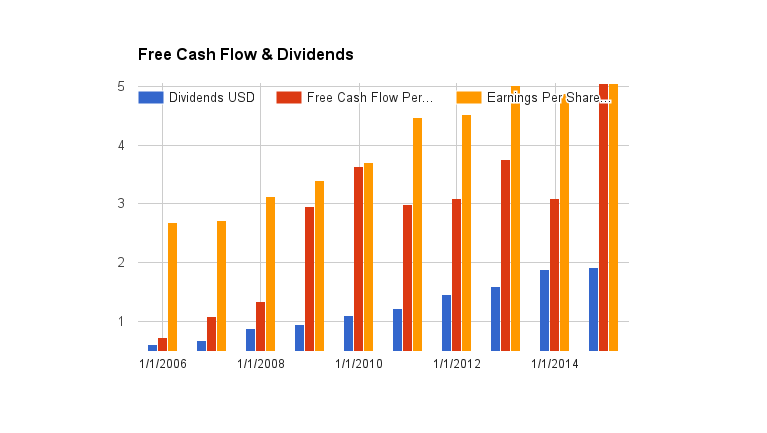 FCF should cover the dividends. As you can see WMT's FCF easily covers the dividend YoY. The dividend should be very safe for many years. I simply use the moat indicator from M*to validate my findings. M* indicates that WMT has a wide moat. Being the largest retailer has its cost advantages while you can impose your will over the vendors. 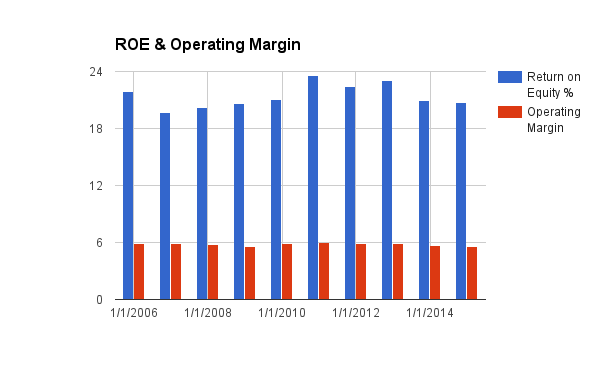 As indicated by ROE & Margin, I do not expect this to change soon. Here, I look for companies with credit rating of BBB+. Just like banks wanting good credit from you when you apply for a loan, you want companies which are stable from a credit perspective. WMT's credit rating from M* is AA. I look at the debt to equity ratio (<50) and cash to debt (<1) and interest coverage (>5). Sometimes, a little good debt is good for a business. But too much debt can bring it down. WMT Cash to Debt 0.2 and it's Interest Coverage is 11 - which means it is financially safe. The Debt to Equity is around 60% which is higher than my 50% threshold. 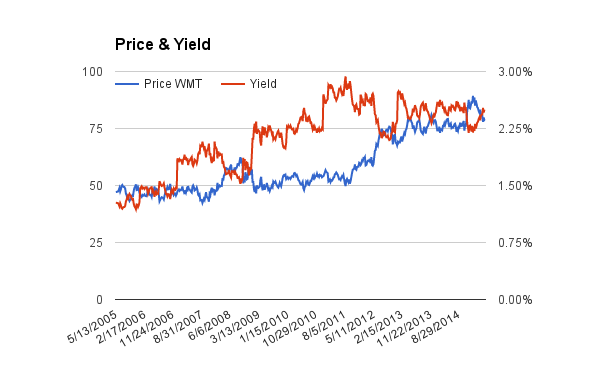 As you can see, WMT actually did a good job the last 3 years to reduce its Debt/Equity threshold. I am looking for 3 stars and above from either. A four star is a bonus. I am seeing that if the combined M* & S&P Capital IQ stars is 7 or more, then this usually is a good indication to buy (if the company has good fundamentals). WMT combined stars is 8 - which means it is a good indication to buy. Dividend yield is 2.5% which is below my threshold of 3%. 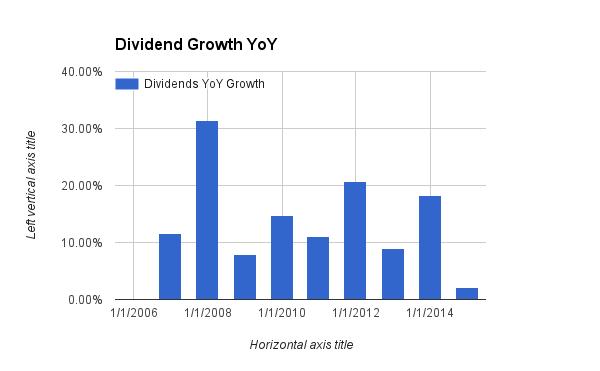 The average YoY dividend growth is not great in the last couple of years 2014-2015 with ~2%. WMT's Chowder is 15.4% - which is over the threshold, but the dividend growth in the near term is a concern. The payout ratio for WMT is under 40% much lower than the threshold of 60%. This shows the WMT has room to continue its dividend and even grow it. 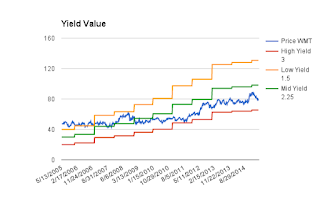 The current yield per average yield for 5 years ratio is 1.09. I use this as a quick indicator for fair valuation (if greater than 1.1). Normally, my screen would miss this. Using the dividend yield theory spreadsheet (based on the Dividends Don't Lie book), I calculate the mid and high points for the yield, from which I derive the price. Based on the price/yield chart, I estimate the high/low yields to be 3.0% and 1.5% respectively. I am okay to buy great companies at reasonable prices and I think the price lower than 80 is reasonable for WMT. It is much better to buy in the low 70s. Also, using the dividend play book DDRM model per the Dividend Playbook, I try to estimate the total return. Using the growth information from above, I used a conservative growth rate of 6%. I estimate the projected return to be around 10.6%. I am happy with anything over 10%. So, the price range is slightly around my mid price point. Morningstar gives WMT a fair value of 83. S&P capIQ gives a fair value if 92. Therefore, with a current price around 78, WMT is reasonably priced. 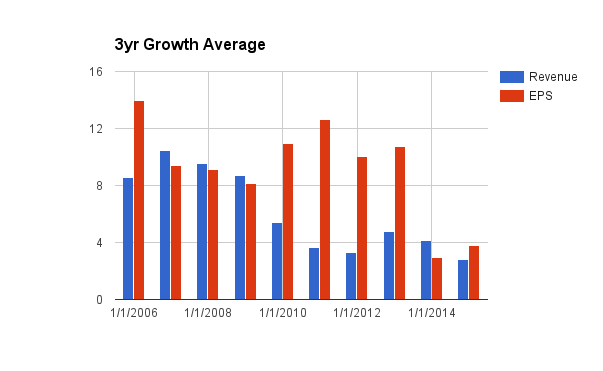 Walmart is facing slowing growth as shown in the declining 10 yr growth averages. International stores are not doing well. They need this to provide future growth. The Ecommerce platform is affecting sales at the brick and mortar stores. Lower prices mean constant pressure on their margins. I think Walmart is an excellent company but it is having some difficult problems with growth. 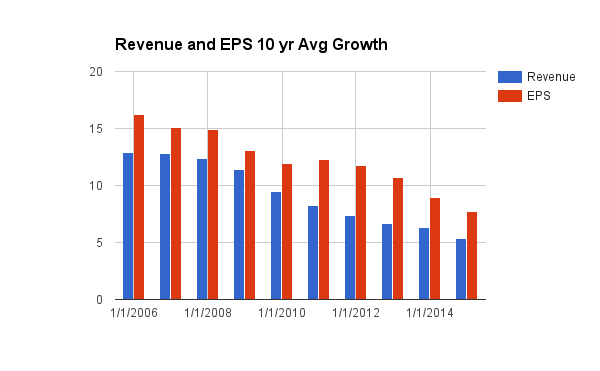 This is reflected in the reduced EPS and revenue 10 year average growth as well as the small dividend increases. Since I don't have any positions in Walmart, I am willing to add a small position - knowing that growth will be stagnant in the near term. Future positions will be considered only if their is a major dip or if Walmart improves on the growth aspects. Recently, I added 22 shares in Walmart at $78. This will add around $43 to my estimated forward dividends. That's it for now. Please let me know what you think of WMT. Dividend Empire, thanks for visiting. I am glad my analysis is useful for you. $75 is a good price for WMT. Happy investing! What to do with SOUHY?